In Part I of the Permanent Portfolio Shakedown we investigated the history of the approach, tracing it back to Harry Browne in 1982. The company he helped to found, The Permanent Portfolio Family of Funds, has been running their version of the strategy in a mutual fund for almost 30 years, with fairly impressive results. Harry’s critical revelation was that no amount of knowledge about markets or economies will enable an investor to accurately see into the future, so investors should balance portfolios between diversified asset classes to ‘mitigate risk regardless of the economic climate’. This is consistent with the broad intention of Ray Dalio’s ‘All Weather’ portfolio and the ‘Risk Parity’ paradigm he spawned, with important differences that we will address later in this article. Later in his career, Harry suggested that a permanent portfolio could be constructed very simply with equal allocations to stocks, Treasuries, t-bills and gold. We explored this simple mix in Part 1 to discover how well this portfolio has done since 1970 relative to other common allocation strategies, such as 60/40, and discovered that the ‘Simple Permanent Portfolio’ approach has delivered relatively impressive results over the past 40 years. The Permanent Portfolio Family of Funds has been running their Permanent Portfolio mutual fund since 1983, so we wanted to explore the performance of the actual fund versus the simple version since the fund’s inception. The Permanent Portfolio Family of Funds only provides annual returns to the mutual fund since inception, so the chart reflects annual returns to both approaches. You will note visually that the simple portfolio tracks the mutual fund quite well, and indeed the correlation between them is 0.70 over the period, which suggests that the simple portfolio explains about 50% of the returns to the mutual fund over the period. PRPFX had a miserable year in 1984, losing about 13% that year while the simple portfolio held in with a return that year of about 4%, but PRPFX made up for it from 2002 – 2007 with substantially higher returns than the simple portfolio, perhaps because of its exposure to real estate. The annualized returns to the fund are 6.8% vs. 7.8% for the simple version, but this difference would be accounted for by the fund’s 0.76% MER and the fees one would incur to purchase the indices in the simple portfolio in ETF form. After accounting for this, the returns are effectively the same. 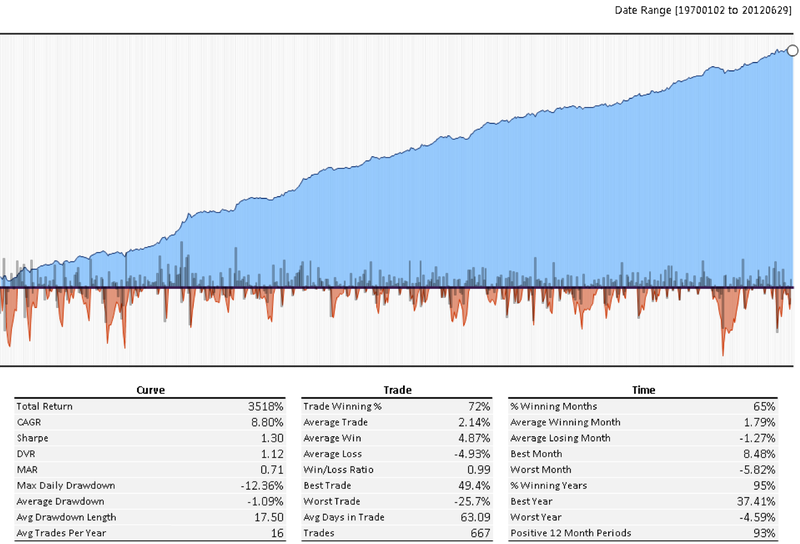 The volatility of the simple portfolio is lower however, at least using annual return data. PRPFX has a realized annual volatility of 8.3 vs. 5.3 for the simple version, which means the return/risk ratio is lower for the mutual fund: 0.82 vs. 1.45. The rest of this article will utilize daily long-term data for each of the four asset classes in the simple version of the approach going back to 1970. The simple permanent portfolio delivered the following return and risk profile going back to 1970 (a review from Part 1). You will note annualized returns of 8.55%, a return/volatility ratio of 1.25, and a maximum drawdown of about 18%, with 93% of rolling 12-month periods delivering positive nominal returns (right bottom corner of data table). We will benchmark all subsequent tests against this basic profile. The Permanent Portfolio approach has a faithful following, and for good reason, but we are going to risk introducing a few simple overlays to the basic approach in an effort to improve risk adjusted returns. The most obvious first step, at least for us, is to introduce a volatility management overlay to maintain a consistent risk profile in all market environments. In our experience, we have yet to examine a portfolio management approach where the return/risk profile is not improved by intelligent volatility management. The long-term ex-post observed volatility of the basic simple permanent portfolio is 7%, so we will use this target to actively manage the portfolio volatility using the exact same 25% capital allocation to each of the four asset classes. As a reminder, we target portfolio volatility by measuring the volatility of the portfolio at each rebalance period and adjusting total portfolio exposure lower if observed volatility is too high by adding cash. 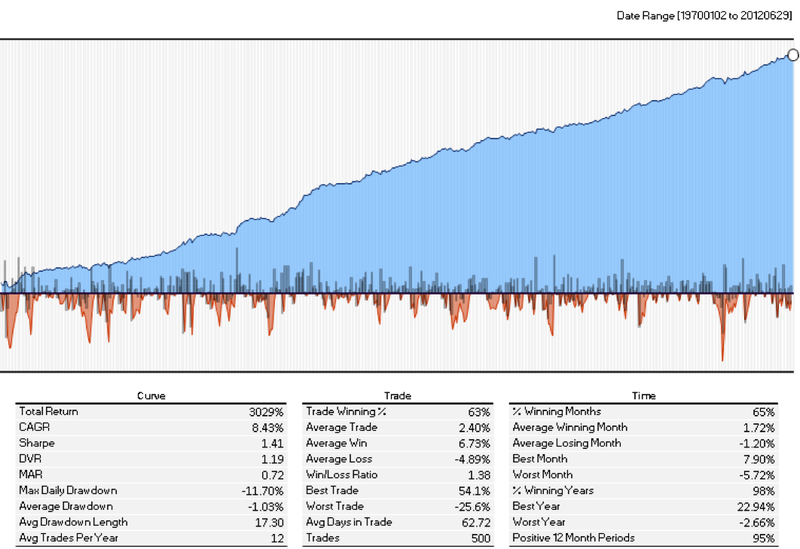 The volatility targeting approach seems to add some value, raising returns from 8.55% to 8.8% annualized, and reducing the maximum drawdown to 12.4% from 18%, or about one third. This seems like a simple, coherent, and intuitive improvement that is worthwhile implementing. Risk Parity proponents will protest that the current incarnation of the simple approach has a massively skewed risk profile. Chart 4. shows the return and risk contributions for each of the 4 asset classes in the basic equal weight approach – you may have to click on the image for a readable version. IRX is the t-bill (cash) index. You can see that stocks and gold (VTILT and GLDLT respectively) contribute about 5x – 8x as much marginal volatility to the portfolio as Treasuries (IEFLT), though they only contribute about 25% more returns. The marginal risk contribution accounts for the risk each asset contributes to the portfolio after accounting for the asset’s diversification potential. While Treasuries are structurally less volatile than stocks or gold over the long-term, they also provide stronger diversification than either stocks or bonds within the portfolio. As a result, Treasuries ‘hit above their weight class’ in the portfolio in terms of the diversification they provide relative to the risk they introduce. This explains why the marginal risk contribution of stocks and gold is greater than either’s proportional volatility, while the risk contribution of bonds is lower than bond’s proportional volatility. Adherents to the risk parity philosophy aim to create portfolios where each asset class contributes an equal amount of volatility to the portfolio rather than an equal amount of capital. Chart 5. approximates a risk parity approach using stocks, gold and Treasuries, with a 7% risk target. The cash allocation is dynamic where cash expands and contracts in the portfolio in order to keep the portfolio volatility close to our 7% target. The 7% target volatility risk parity version above delivers similar returns to the traditional simple approach, with 13% lower volatility and 35% lower drawdown. However, the ex-post allocation to cash at a 7% volatility target is just 8%. In order to have a 25% average allocation to cash over the period, in keeping with the traditional simple approach, we need to apply a 5% risk target instead. The realized ex-post volatility of the 5% target volatility risk parity permanent portfolio is just 4.84%, and the largest drawdown was just 8.4%, for which investors would have been compensated with a 7.89% annualized return. Pretty amazing for a portfolio with half the volatility and just 25% of the drawdown of a typical bond portfolio! We’ll really be treading on thin ice with the die-hard permanent portfolio crowd with these next simulations, but I hope they will forgive our impiety in our perpetual pursuit of a ‘better way’. The potential problem, as we see it, with any static asset allocation, including the permanent portfolio’s permanent equal weight allocations to stocks, bonds, gold and cash, is that sometimes everything is expensive all at once, and returns to all asset classes have the potential to be low or negative in tandem. The current environment may represent one of these periods, where certainly bonds and cash are more expensive than they have ever been, with yields on Treasuries lower than at any other time in the last 220 years (source: Bank of America). Cash yields essentially zero. We think stocks are expensive as well (see here and here), and gold is at best a wildcard, having rallied by 500% or more from its lows in 2001. If we are right, and the permanent portfolio is vulnerable to synchronized losses, then it makes sense to explore some tactical or dynamic overlays to help avoid investing in asset classes in sustained downtrends. Mebane Faber is credited with bringing moving averages to the masses with his Quantitative Approach to Tactical Asset Allocation whitepaper in 2005. In it, he describes an approach that applies a 10-month moving average to basket of 5 asset classes: stocks, Treasuries, commodities, REITs and international stocks. While there is nothing magical about the 10-month moving average, this approach is ubiquitously cited elsewhere, and in our testing we observed no material difference with other moving averages. The following simulations apply monthly rebalancing. Chart 7. delivers a pretty compelling equity line. 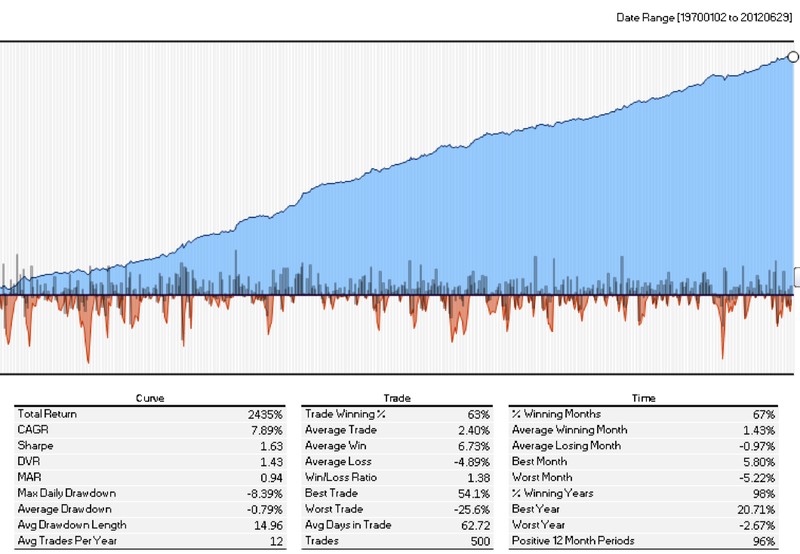 You will note that returns rise above 10% annualized over the period while volatility and drawdowns remain similar to the original simple approach. The majority of losses to this approach occurred during the tumultuous 1970s and 1980, with the largest drawdown occurring in March of 1980 as gold and stocks collapsed at the same time while both were far above their respective 10-month moving averages. 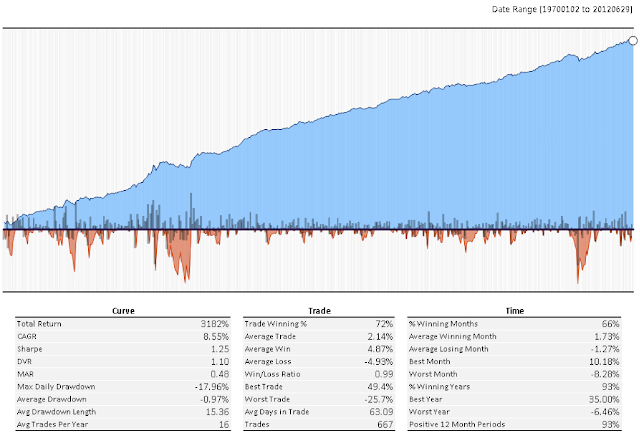 We stated above that risk adjusted returns are almost always improved by managing portfolio level volatility, so below we tested the Faber 10-month moving average approach but also applied a 7% target volatility overlay. Chart 8 shows the results of this combination. Now we are really cooking! While the absolute performance of the approach drops by about 0.4 percentage points per year, the risk profile drops dramatically; volatility drops to 5.5% annualized and the maximum drawdown drops to 9% from 19%. Even better, investors would have realized positive results over 98% of rolling 12-month periods! 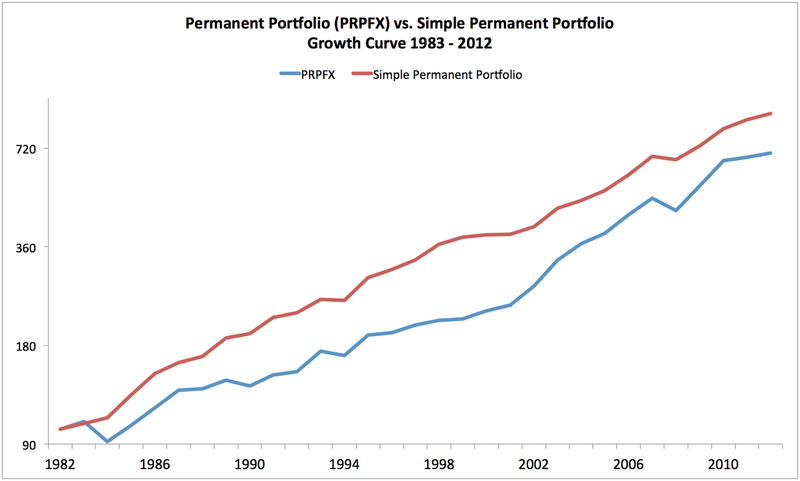 Permanent Portfolio adherents are right to be proud of the performance of their approach over the past 40 years. Of all the static asset allocation approaches we have tested, the PP ranks near the top of the list in terms of risk-adjusted returns. Further, the philosophy behind its construction is consistent with the goal of resilience in the face of any economic environment. Even PP zealots would be silly not to consider some of the simple volatility-based overlays that we presented however. 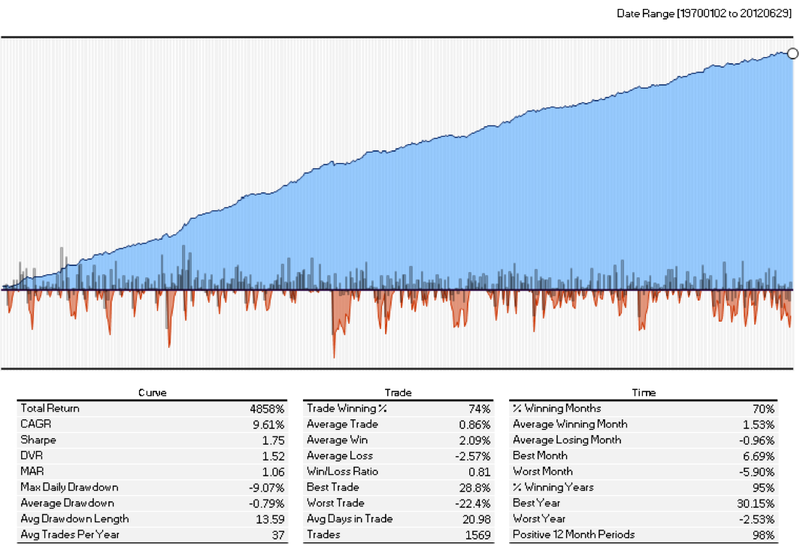 Simple volatility management techniques are philosophically and empirically coherent, and deliver similar results with much smaller drawdowns. While risk management is important, it does not address the most important challenge to the traditional portfolio: what happens next. That is, how will the traditional model behave going forward in the current environment, where all assets have been artificially inflated at once via coordinated global central bank intervention. Will the portfolio prove resilient to a period of sustained global deflation with Treasury yields already at record lows? Tactical overlays to the traditional approach may help address this problem by systematically exiting asset classes that are exhibiting strong and/or sustained negative price trends. The simple Faber moving average approach on its own does not seem to deliver much value above the profile of the traditional PP approach. However, combining a tactical moving average approach with simple volatility management delivers similar high returns, but without the major drawdown characteristics of the simple MA approach. Further, this approach delivered positive returns over 98% of periods since 1970.